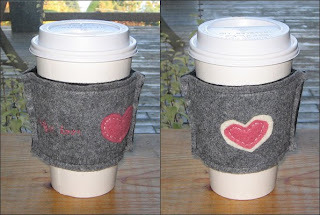 Last week my friend Stephanie mentioned she wanted to try making coffee sleeves - maybe knitting some. Then I was at Wheatberries on the weekend and grabbed a cardboard coffee sleeve and decided to also make some coffee sleeves. 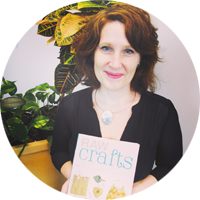 I used the cardboard sleeve as my pattern. It was a super easy project. I made 2 sleeves in a jiffy! I ended up finding a home for one before I had a chance to take a photo but here's my first sleeve - it says "coffee love" which is what I have! I also finished up this pillow cover last weekend. I'm not sure if I'm completely happy with it - mainly the colours. 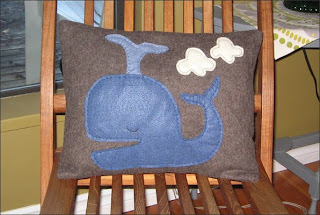 I think the whale may be too dark but I'm sure I'll find a home for the pillow. 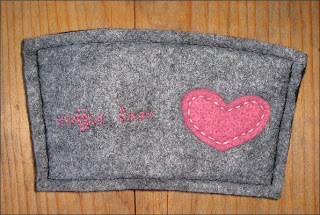 While organizing my pile of fabric, I came across the sleeves from a wool sweater I felted ages ago. The sleeves are a gorgeous soft black and the wool is quite thick. I decided to cut up the sleeves and make some baby booties. I added a heart to each then was done. I'm going to make a couple of more pairs this week. 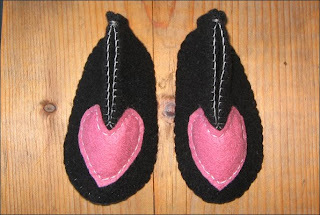 I'm making a pair for a friend that will have a bright blue bird on each bootie. I finished up my fourth wine bag and donated it to a silent auction at work. Awhile ago I donated a set of pillows. The wine bag donation goes to a gift basket my team is putting together. I'll be sure to get a photo before it's too late! I'm just hoping the set of pillows I donated sell! Last week I started on some mini Xmas stockings. I'm finishing up my beta this weekend. I'm using a Martha Stewart pattern that I made smaller. It's for putting Xmas goodies into. 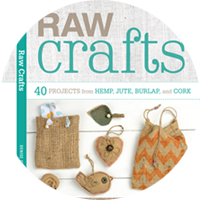 I want to give hostess gifts where you either consume them or can reuse them. Photos coming soon!